Dear Diary, Eureka! I've finally figured out how to layer! And then I went to San Francisco. The very first thing we did after leaving the hotel was B-linging it to the nearest shopping avenue to buy an army green cargo jacket. A green cargo jacket was something I’d been eying for years, but never needed it. But I wore it every day and turns out to be a great layering piece. The next day we went took a walking tour around the Presidio, and went shopping for more layers. That night we at dinner at Tadish's for my mother’s birthday so I put on my new neutral sweater over my bright silk button up for the evening and zipped into my favorite wedges for the short walk to the restaurant. 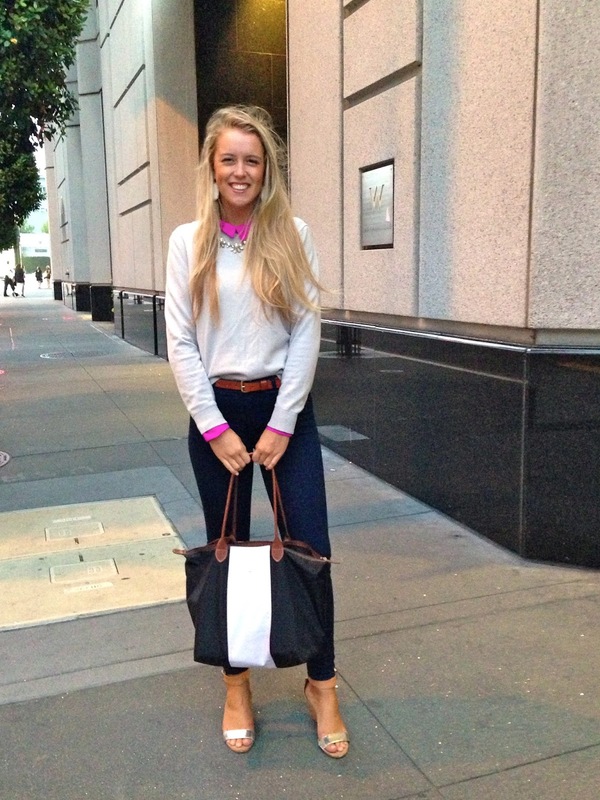 The next day we went to Tiburon and I was really feeling the blue vibes… almost too much! I decided I just had to throw on a sparkly necklace to give a little girly touch to my boyish outfit. So all I needed was a little change in temperature, some more long sleeves in my wardrobe and silk shirts under the sweaters in order to feel comfortable with the layering style! In the mid west we still have a few more months before we can bring our sweaters out of hibernation, but it’s a great look for fall if you have cooler temperatures coming your way! Dear Diary, my Birchbox came today! Lets be real, I never get mail. And who doesn't love getting mail? Especially living in a sorority house where you can dash upstairs and squeal and scream with everyone you see over what you just got. Every time I walked by our mail cubbies at the house I’d look and see if there was anything for me and the answer was almost always “no”. In December on a flight to Chicago, I was reading a magazine and discovered Birchbox. How it works is you sign up for a subscription that costs $10 a month (after a waitlist period, currently about four weeks), and they will send you a personalized box full of high-end samples in an adorable pink box. Of the six to eight samples that come every month, there has been at least one product in every box I decide I simply cannot live without. My favorites so far have been Clark’s Botanical Face Cream, Lancôme mascara, and folle de joie perfume. When you sign up you take a little quiz that helps customize the kinds of product samples you receive (i.e. I wanted more make-up, less lotions and creams, etc.). They also have men’s subscriptions for the guys who need more than the one miracle bottle of shampoo/conditioner/body wash (how is that even possible?). On their website you can buy the full sized products of the samples you received, and many more. Here’s a link to their website -> https://www.birchbox.com/shop/join and this is a list of everything that came in my box this month! 1. DO clean up your social media, its the fastest way for chapter members to learn more about you before meeting you face-to-face and you don't want to make a bad first impression. 2. DO feel free to get your hair done/nails manicured/teeth whitened. If you look your best you’ll feel more confident! 3. DON’T be a cookie-cutter when it comes to your outfits! Chapters want to see your personality, what makes you an individual. So go ahead, wear your favorite Haute Hippie sequined shorts or that giant monogramed hair bow you just bought on Etsy. Plus it’ll be a great conversation starter! 4. DO remember that for the preference round (the final day of recruitment) most chapters have their members dress in all black or all white, so you may want to choose a dress that is neither of those colors. 5. DO take a tote or purse with you with a little notebook and a pen so you can write down thoughts/feelings about each house after you visit. 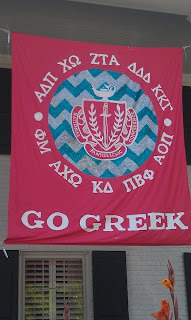 At the schools with a large Panhellenic system the chapters tend to blend together that first day. Also consider packing things you can use to freshen yourself up like travel sized deodorant, blotting tissues, wash cloth, and a hand fan. 6. 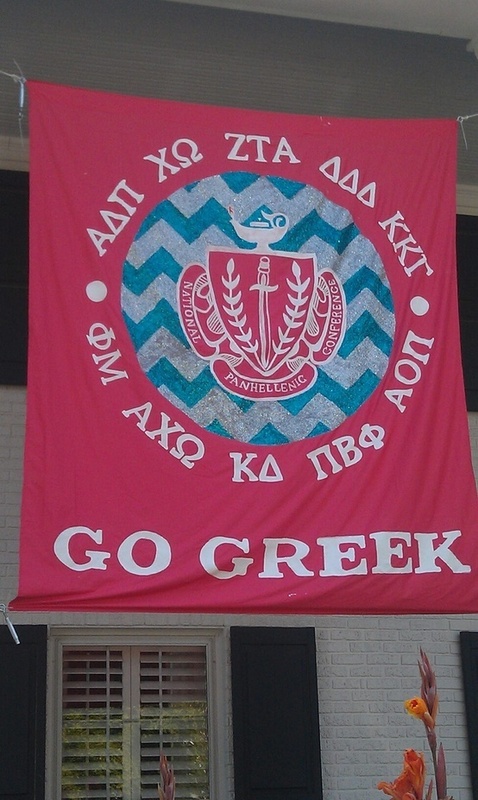 DON’T be too overwhelmed on your first day – I know that’s almost impossible but here’s your fair warning – most sororities on most campuses chant and sing very loudly, in unison… just like the movies. It's supposed to be fun and peppy so don't be afraid to smile and wave back! 7. DON’T listen to any/all rumors you have heard about the chapters/the Recruitment process at your university. 99% of them aren’t true and 100% of them cause unnecessary stress. 8. DO go in open minded. It’s the best way to let yourself really reflect and decide which chapter you feel most comfortable in. Luckily all the beatification you do lasts after Bid Day, cause you’ll want to look your best for the first week of class, football games and date parties. 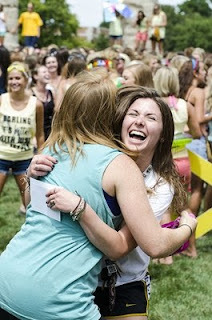 Fall semester is one big photo op and you’ll be glad you put in all the effort you did for recruitment. It’s the gift that keeps on giving! Dear Diary, tomorrow is the 4th of July and I have no idea what to wear! Independence Day is my favorite holiday- it’s in the summer, there are fireworks, cookouts, parades and an overwhelming amount of American pride. Plus it’s almost impossible to go wrong with red, white and blue. After declaring independence, the best decision our founding fathers made was supporting Betsey Ross's flag bearing these fabulous colors. In fact, I’m considering getting married on the 4th of July, with my color scheme being cardinal, eggshell and navy (see my Pinterest for further details). But for this year all I’ve got to do is come up with a few outfits to get me through the festivities, but what’s a girl to wear when there are so many options? I know I can’t be the only girl out there ransacking their closet for the perfect set of outfits. So I decided to round up all my reds, whites and blues to create some killer combos for any American pride event you will attend this year! Above (from L to R): Blue top-Goodwill, white high-waisted shorts- Goodwill, Red belt - Target, white tank- Nordstrom's, gold bangles- Kendra Scott, red silk maxi skirt- Lucca, brown leather belt- Gap, cream crochet dress- Anthropologie, carmel leather sandals- Stavros Melissinos of Athens, Greece, red earrings- Kendra Scott, white striped top- H&M, jean shorts- Lucky Brand, brown leather sandals- Tory Burch. Above (from L to R): Silver/tan Sam Edelman wedges, vintage navy polka dot top, J. Crew white chino shorts, white shift dress from Ann Taylor, red earrings, white earrings and gold bangles from Kendra Scott, vintage red shift dress, white tennies from Walmart, white pony tail cover from Nordstroms, gingham silk button up from Madewell, vingage high-waisted denim skirt, and Tory Burch leather sandals. Above (from L to R): Vintage red belt, J. Crew red sweater, Kendra Scott bangles, Ralph Lauren linen pants, vintage navy silk shirt, vintage red high-waisted shorts, wedges from DSW, mom's vintage belt, J. Crew necklace, Tory Burch sandals, navy polka dot dress from Anthropologie, red Lorac lipstick and handmade hair bow. Above (from L to R): Sam Edelman sandals, beach bag from Academy, striped bikini from Madewell, navy scrunchie and white bandeau swim top from American Apparel, high-waisted red bottoms from Asos, after-sun soothing lotion from Burts Bees, men's gingham button-up from Goodwill, sunglasses from Cream Vintage in Austin, TX, watermelon bikini from American Apparel, hat from Forever 21, and black leather sandals by Reef. Above (from L to R): Red sweater from Forever 21, white lace shorts from Anthropologie, striped summer cashmere cardigan from Gap, coral shorts from J. Crew, vintage navy skirt, red scarf from Macy's, hand made monogramed hair bow, red Lacoste headband, Ralph Lauren cable-knit sweater, vintage denim cutoffs, navy Kendra Scott earrings, Anthropologie halter top, faux pearl/rhinestone earrings from Lucca, white J. Crew chino shorts.